Ok so I saw this movie one Friday, Saturday and Sunday. Talked to friends about it and listened to a few podcasts and there were a few things that really stood out from this melange of Iron Man 3 experiences. I loved this movie otherwise I’m an idiot that loves to spend money on things I hate. While I love it, I can still see it’s flaws and similarities to other films. Similarities to assorted Batman movies. 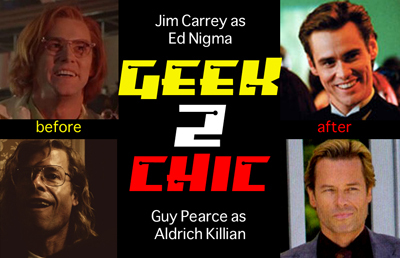 Aldridge Killian(Guy Pearce) in the beginning is really reminiscent of Jim Carey in Batman Forever , where they were goofy geeky scientists that were not socially acceptable and then transform into slick and devious business-men . In Batman Begins, Ra’s al Ghul is thought to be Ken Watanabe for most of the film, but turns out to be Liam Neesen. We were led to believe The Mandarin was the head of this terrorist organization but it turns out not the exotic asian, but the suave european. This happens in the Dark Knight Rises as well where we think Bane is the brains behind the operation, but it turns out to be Miranda Tate the business partner and eventual lover of Bruce Wayne. The difference here is that Bane is actually a physical threat that literally cripples Batman. 3. The Clean Slate as a Thing. The Dark Knight Rises shows that Selina Kyle is willing to work with terrorists to have her criminal record expunged by using the Clean Slate, a program or virus that for some reason is being developed by Wayne Enterprises. Tony’s Clean Slate is different, but it’s also powerful leverage in the film because it gets him back in Pepper Pott’s Good graces. As he destroys all of his armors and cuts down on his distractions. Not a big deal but something I noticed. Bruce Wayne’s mansion gets destroyed by his enemies and he has to crawl out the wreckage in Batman Begins. Tony’s house is also obliterated by his enemies. His enemies that represent a terrorist threat. Bruce Wayne needs to lift a wooden plank off of his chest, Tony Stark has to lift a huge structure of of himself, using his strength too, this AI he developed.